A drawing of the human brain. The brain is a centralized mass of nerve tissue enclosed within the cranium (skull) of vertebrates; a related structure is also present in some invertebrates. This organ functions to process, store, and interpret information and to control the physiology and behavior of the body. In higher organisms, it is also the site of reason and intelligence, which include such components as cognition, perception, attention, memory and emotion. Along with the spinal cord, the brain forms part of the central nervous system, a vast network of neurons that receives sensory signals from the peripheral nervous system and conveys information to the muscles and glands of the body. Neurons, which generate action potentials that communicate information to other cells, constitute the essential class of brain cells. The human brain, for example, contains more than 10 billion neurons, each linked to as many as 10,000 other neurons. The brain also contains various types of glial cells, which support the function of neurons. The vertebrate brain has three main sections, commonly referred to as the hindbrain, midbrain, and forebrain, each of which contains several structures. In general, as one moves from hindbrain to forebrain, one progresses from structures involved in more autonomic (or involuntary) functioning (like walking or maintaining constant heart rate) to those coordinating higher functioning (such as learning and memory). 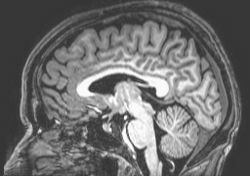 Representation of a brain MRI, an imaging technique used to measure neural activity. As we travel up the vertebrate phylogenetic scale from fish to mammals, the cerebrum (a structure within the forebrain) increases in size, complexity, and importance, dominating the nervous systems of mammals. For example, major damage to this area results in severe impairment or even coma in mammals, while a shark whose cerebrum has been removed can swim with relatively normal function. Nonetheless, animals have many structures in common, and progress in neuroscience, a field of biology aimed at understanding the functions of the brain at every level, has come from research on the simpler nervous systems of invertebrates. The brain is composed of two broad classes of cells, neurons and glia, both of which contain several different cell types that perform specialized functions. The neuron is the functional unit of the brain. 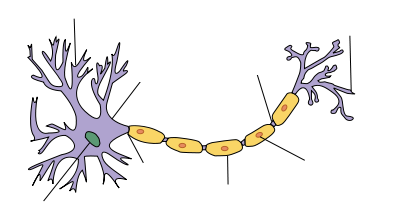 Interconnected neurons form neural networks (or neural ensembles). These networks are similar to man-made electrical circuits in that they contain circuit elements (neurons) connected by biological wires (nerve fibers). These do not form simple one-to-one electrical circuits like many man-made circuits, however. Typically, neurons connect to at least one thousand other neurons (Jungueira and Carneiro 2003). These highly specialized circuits make up systems that are the basis of perception, different types of action, and higher cognitive function. In addition to neurons, the brain contains glial cells in a roughly 10:1 proportion to neurons. Glial cells (glia is the Greek term for “glue”) form a support system for neurons. They create the insulating myelin, provide structure to the neuronal network, manage waste, and clean up neurotransmitters. The blood-brain barrier is constructed by a particular class of glial cell called astrocytes. Blood vessels throughout the body are permeable to many chemicals, some of which are toxic; thus, the astrocytes form a barrier to these chemicals by surrounding the smallest, most permeable blood vessels in the brain. Protection is crucial because, unlike other tissues of the body, the brain cannot recover from damage by generating new cells (in mammals, production of neurons by cell division ceases shortly after birth). However, the barrier is not totally impermeable: fat-soluble substances like anesthetics and alcohol have notable effects on the brain. The gray matter of the brain refers to a core area with many cell bodies (soma) of neurons, while white matter is made up of bundles of axons running up and down the cord, colored white because most axons are covered with a myelin sheath. The space between neurons is filled with dendrites as well as unmyelinated segments of axons; this area is referred to as the neuropil. In mammals, the brain is surrounded by connective tissues called the meninges, a system of membranes that separate the skull from the brain. This three-layered covering is composed of the dura mater, arachnoid mater, and pia mater. The arachnoid and pia are physically connected and thus often considered as a single layer, the pia-arachnoid. Blood vessels enter the central nervous system through the perivascular space above the pia mater. The cells in the blood vessel walls are tightly joined, forming the blood-brain barrier described above. The brain is bathed in cerebrospinal fluid (CSF), which circulates between layers of the meninges and through cavities in the brain called ventricles. This fluid is important both chemically (for metabolism) and mechanically (for shock-prevention). For example, the mass and density of the brain are such that it will begin to collapse under its own weight if unsupported by the CSF. The CSF allows the brain to float, easing the physical stress caused by the brain’s mass (an adult human brain weighs approximately 1.5 kg). A diagram depicting the main subdivisions of the embryonic vertebrate brain. These regions will later differentiate into forebrain, midbrain and hindbrain structures. Early in the development of all vertebrate embryos, a hollow neural tube forms three swellings at the head of the embryo that become the basic divisions of the brain: the hindbrain, midbrain, and forebrain. The rest of the tube develops into the spinal cord. Cranial and spinal nerves, which constitute the peripheral nervous system, sprout from the tube and continue to grow throughout embryonic development. The medulla and pons contain distinct groups of neurons involved in the control of physiological functions like breathing or basic motor patterns like swallowing. The cerebellum orchestrates and refines behavior patterns. Midbrain (mesencephalon). All information conveyed between the higher brain and spinal cord must pass through the midbrain, which also contains structures involved in processing aspects of visual and auditory information. 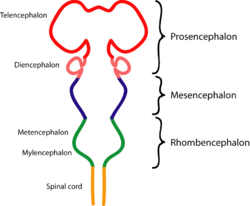 Diencephalon (central region). An upper structure (the thalamus) is the final relay station for sensory information going to the telencephalon. A lower structure called the hypothalamus regulates many physiological functions and biological drives. The telencephalon (surrounding structures) consists of two cerebral hemispheres, also known as the cerebrum; in humans and other mammals, the cerebrum is by far the largest part of the brain, and it plays major roles in sensory perception, learning, memory, and conscious behavior. Communication between the spinal cord and telencephalon travels through medulla, pons, midbrain, and diencephalons, structures that are collectively referred to as the brain stem. In general, more primitive and autonomic (involuntary or unconscious) functions are coordinated farther down this axis, while more complex and evolutionarily advanced functions are found higher on the brain stem. Reticular system. A network of neuronal fibers that includes discrete groups of neurons (called nuclei), distributed through a core of the medulla, pons, and midbrain. These specialized groups alert the forebrain to information coming from specific regions of the peripheral nervous system. Some nuclei are involved in controlling sleep and wakefulness. Limbic system. The evolutionarily primitive parts of the forebrain, which still have important functions in birds and mammals, but are completely covered by the more recent elaborations of the telencephalon called the neocortex. The limbic system is responsible for basic physiological drives, instincts, and emotions, though pleasure and pain centers in the limbic system are believed to play roles in learning and physiological drives. The hippocampus, one part of the limbic system, is necessary for the transfer of short-term memory to long-term memory in humans. Cerebrum. Regions of the brain that interact for consciousness and control of behavior. The cerebral cortex is a sheet of gray matter that covers each cerebral hemisphere; it is convoluted (or folded) into ridges (called gyri) and valleys (called sulci) so that it fits into the skull. The corpus callosum is a white-matter tract that links the two hemispheres. Although the functions of some regions of the cerebral cortex are relatively easy to isolate and define, others are not: the latter areas fall under the general name of association cortex. The temporal lobe is an upper region involved in receiving and processing auditory information. Its association areas are involved in the recognition, identification, and naming of objects. The occipital lobe receives and processes visual information. Its association areas are essential for making sense of the visual world and translating visual experience into language. 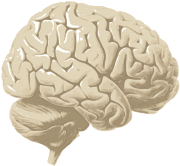 The parietal lobe contains the primary somatosensory cortex, which receives information through the thalamus about touch and pressure sensations. A major association function of the parietal lobe is attending to complex stimuli. The frontal lobe contains a strip called the primary motor cortex. Its association functions are diverse and best described as having to do with planning. Three groups of animals have notably complex brains: the arthropods (insects, crustaceans, arachnids, and others); the cephalopods (octopuses, squids, and similar mollusks); and the craniates (vertebrates and hagfish) (Butler, 2000). The brain of arthropods and cephalopods arises from twin parallel nerve cords that extend through the body of the animal, while that of craniates, as described above, develops from the anterior section of a single dorsal nerve cord, which later becomes the spinal cord (Kandel et al. 2000). The insect brain has four parts: the optical lobes, the protocerebrum, the deutocerebrum, and the tritocerebrum. The optical lobes, located behind each eye, process visual stimuli (Butler 2002). The protocerebrum contains the central body complex and the mushroom bodies, which respond to smell. In some species such as bees, the mushroom body also receives input from the visual pathway. The deutocerebrum includes the antennal lobes, which are similar to the mammalian olfactory bulb, and the mechanosensory neuropils, which receive information from touch receptors on the head and antennae. In cephalopods, the brain has two regions: the supraesophageal mass and the subesophageal mass, separated by the esophagus (Butler 2002). These two components are connected by the basal lobes and the dorsal magnocellular lobes. The large optic lobes are sometimes not considered to be part of the brain, as they are anatomically separate and are joined to the brain by the optic stalks. However, the optic lobes perform most visual processing, and so functionally are part of the brain. Vertebrate nervous systems are distinguished by bilaterally symmetrical encephalization, which refers to the tendency for more complex organisms to gain larger brains through evolutionary time. In vertebrates, increased size and complexity of the cerebral cortex correlate with height on the phylogenetic and evolutionary tree. Primitive vertebrates such as fish, reptiles, and amphibians have fewer than six layers of neurons in the outer layer of their brains, a configuration called the allocortex. More complex vertebrates such as mammals have a six-layered neocortex, in addition to some parts of the brain that are allocortex (Martin, 1996). In mammals, increasing convolutions (folds) of the brain are also characteristic of animals with more advanced brains. These convolutions provide a larger surface area for a greater number of neurons, while keeping the volume of the brain compact enough to fit inside the skull. 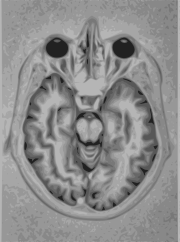 An animation of the human brain with the lobes highlighted. The structure of the human brain differs from that of other animals in several important ways, corresponding in function to more advanced cognitive skills. Human encephalization is especially pronounced in the neocortex, the most complex part of the cerebral cortex. The proportion of the human brain that is devoted to the neocortex—especially to the prefrontal cortex—is larger than in all other mammals. The most dramatic increase in size of the cerebral cortex took place during the last several million years of human evolution; though elephants, whales, and porpoises have larger brains in terms of mass, if we compare brain size to body size, humans and dolphins top the list, and humans have the largest ratio of brain size to body size. Although humans have unique neural capacities, much of their brain structure is similar to that of other mammals. Basic systems that alert the nervous system to stimuli, sense events in the environment, and monitor the condition of the body are similar to those of even non-mammalian vertebrates. Thus, the neural circuitry underlying human consciousness includes both the advanced neocortex and prototypical structures of the brain stem. Vertebrate brains receive signals through nerves arriving from the sensors of the organism (known as afferent nerves). These signals are then processed throughout the central nervous system; reactions are formulated based upon reflex and learned experiences. A similarly extensive nerve network, composed of efferent nerves, delivers signals from the brain that control important muscles throughout the body. Anatomically, the majority of afferent and efferent nerves (with the exception of the cranial nerves), are connected to the spinal cord, which then transfers signals to and from the brain. Sensory input is processed by the brain to recognize danger, find food, identify potential mates, and perform more sophisticated functions. The visual, touch, and auditory pathways of vertebrates are routed to specific nuclei of the thalamus and then to regions of the cerebral cortex that are specific to each sensory system. Olfactory pathways are routed to the olfactory bulb, then to various parts of the olfactory system. Taste is routed through the brain stem and then to other portions of the gustatory system. To control movement, the brain has several parallel systems of muscle control. The motor system controls voluntary muscle movement, aided by the motor cortex, cerebellum, and the basal ganglia. The system eventually projects to the spinal cord and then out to the muscle effectors. Nuclei in the brain stem control many involuntary muscle functions such as heart rate and breathing. In addition, many automatic acts (simple reflexes, locomotion) can be controlled by the spinal cord alone. In addition to its role in the nervous system, the brain is also involved in the body's chemical communication system (the endocrine system). The pituitary gland in the brain produces a portion of the body's hormones, which in turn can influence the production of hormones in other organs and glands; conversely, the brains reacts to certain hormones produced elsewhere in the body. Hormones, incoming sensory information, and cognitive processing performed by the brain determine the brain state. Stimulus from any source can trigger a general arousal process that focuses cortical operations to processing of the new information, a process known as attention. Cognitive priorities are constantly shifted by a variety of factors, such as hunger, fatigue, belief, unfamiliar information, or threat. Clinically, death is defined as an absence of brain activity as measured by EEG (a technique that gauges changes in electrical current from the cerebral cortex). Injuries to the brain tend to affect large areas of the organ, sometimes resulting in major deficits in intelligence, memory, and movement. Head trauma from, for example, vehicle and industrial accidents, is a leading cause of death in youth and middle age. In many cases, more damage is done by resultant swelling (edema) than by the impact itself. Stroke, which results from blockage or rupturing of blood vessels in the brain, is another major cause of death from brain damage. Other problems involving the brain can be more accurately classified as diseases rather than injuries. Neurodegenerative diseases, such as Alzheimer's disease, Parkinson's disease, motor neurone disease, and Huntington's disease, are caused by the gradual death of individual neurons, leading to declines in movement control, memory, and cognition. Currently, only the symptoms of these diseases can be treated. Mental illnesses, such as clinical depression, schizophrenia, bipolar disorder, and post-traumatic stress disorder, are brain diseases that impact personality and often other aspects of mental and somatic function. Some infectious diseases affecting the brain are caused by viruses and bacteria. Infection of the meninges, the membrane that covers the brain, can lead to meningitis. Encephalitis is an acute inflammation of the brain, commonly caused by a viral infection. An inflammation that includes both the brain and the spinal cord is called encephalomyelitis. Bovine spongiform encephalopathy (also known as mad cow disease), is deadly in cattle and humans; kuru is a similar prion-borne degenerative brain disease affecting humans. Both are linked to the ingestion of neural tissue, and may explain the tendency in some species to avoid cannibalism. Viral or bacterial causes have been substantiated in multiple sclerosis, Parkinson's disease, Lyme disease, and encephalopathy. Other brain disorders are congenital. Tay-Sachs disease, Fragile X syndrome, and Down syndrome are all linked to genetic and chromosomal errors. Malfunctions in the embryonic development of the brain can be caused by genetic factors, drug use, and disease during a mother's pregnancy. Neuroscience seeks to understand the nervous system, including the brain, from a biological and computational perspective, while psychology seeks to understand the brain's relation to behavior. 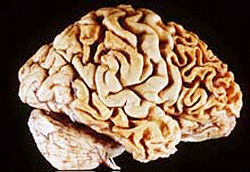 The terms neurology and psychiatry usually refer to medical applications of neuroscience and psychology respectively. Cognitive science is an interdisciplinary endeavor that attempts to unify neuroscience and psychology with other fields that concern themselves with the brain, such as computer science and philosophy. One controversial endeavor involving the study of the brain has involved efforts to create artificial intelligence, which seeks to replicate brain function—although not necessarily brain mechanisms. Computer scientists have produced simulated neural networks loosely based on the structure of neural connections in the brain. Creating algorithms to mimic a biological brain is very difficult because the brain is not a static arrangement of circuits, but a network of vastly interconnected neurons that are constantly changing their connectivity and sensitivity. More recent work in both neuroscience and artificial intelligence models the brain using the mathematical tools of chaos theory and dynamical systems. Current research has also focused on recreating the neural structure of the brain with the aim of producing human-like cognition and artificial intelligence. A scan of the brain using fMRI. By placing electrodes on the scalp, one can record the summed electrical activity of the cortex through a technique known as electroencephalography (EEG). EEG measures the mass changes in electrical current from the cerebral cortex, but can only detect changes over large areas of the brain with very little sub-cortical activity. Apart from measuring the electric field around the skull, it is possible to measure the magnetic field directly in a technique known as magnetoencephalography (MEG). This technique has the same temporal resolution as EEG but has much better spatial resolution. Its main advantage over fMRI is a direct relationship between neural activation and measurement. Functional magnetic resonance imaging (fMRI) measures changes in blood flow in the brain, but the activity of neurons is not directly measured, nor can it distinguish between inhibitory or excitatory activity. fMRI is a noninvasive, indirect method for measuring neural activity. The changes in blood flow that occur in capillary beds in specific regions of the brain are thought to represent various neuronal activities (metabolism of synaptic reuptake). Similarly, a positron emission tomography (PET) is able to monitor glucose and oxygen metabolism as well as neurotransmitter activity in different areas within the brain that can be correlated to the level of activity in that region. Behavioral tests can measure symptoms of disease and mental performance, but can only provide indirect measurements of brain function and may not be practical in all animals. In humans, however, a neurological exam can be done to determine the location of any trauma, lesion, or tumor within the brain, brain stem, or spinal cord. A distinction is not often made in the philosophy of mind between the mind and the brain, and there is some controversy as to their exact relationship, leading to the mind-body problem. The mind-body problem concerns the explanation of the relationship, if any, that obtains between minds, or mental processes, and bodily states or processes. The brain is defined as the physical and biological matter contained within the skull, responsible for all electrochemical neuronal processes. The mind, however, is seen in terms of mental attributes, such as beliefs or desires. There is a concept, tracing back at least to Plato, Aristotle, and the Sankhya and Yoga schools of Hindu philosophy, that "mental" phenomena are, in some respects, "non-physical" (distinct from the body). Only some adhere to metaphysically dualistic approaches in which the mind exists independently of the brain in some way, such as a soul, epiphenomenon, or emergent phenomenon. Other dualisms maintain that the mind is a distinct physical phenomenon, such as an electromagnetic field or a quantum effect. Some envision a physical mind that mirrors the physical body, guiding its instinctual activities and development, while adding the concept for humans of a spiritual mind that mirrors a spiritual body and including aspects like philosphical and religious thought. Some materialists argue that mentality is equivalent to behavior or function or, in the case of computationalists and strong AI theorists, computer software (with the brain playing the role of hardware). Idealism, the belief that all is mind, still has some adherents. At the other extreme, eliminative materialists believe that minds do not exist at all, and that mentalistic language will be replaced by neurological terminology. Bear, M. F., B. W. Connors, and M. A. Paradiso. 2001. Neuroscience: Exploring the Brain. Baltimore: Lippincott. ISBN 0781739446. Butler, A. B. 2002. Chordate evolution and the origin of craniates: An old brain in a new head. The Anatomical Record 261: 111–25. Junqueira, L. C., and J. Carneiro. 2003. Basic Histology: Text and Atlas, 10th edition. New York: Lange Medical Books, McGraw-Hill. ISBN 0071215654. Kandel, E. R., J. H. Schwartz, and T. M. Jessell. 2000. Principles of Neural Science, 4th ed. New York: McGraw-Hill ISBN 0838577016. Martin, J. H. 1996. Neuroanatomy: Text and Atlas, 2nd ed. New York: McGraw-Hill. ISBN 007138183X. Sala, S. D., ed. 1999. Mind Myths: Exploring Popular Assumptions About the Mind and Brain. New York: J. Wiley & Sons. ISBN 0471983039. Vander, A., J. Sherman, and D. Luciano. 2001. Human Physiology: The Mechanisms of Body Function. New York: McGraw-Hill. ISBN 0071180885. Hawkins, Jeff. 2003. How brain science will change computing. Monterey, CA: Ted Talks. How Your Brain Works at HowStuffWorks. BrainMaps.org, interactive high-resolution digital brain atlas based on scanned images of serial sections of both primate and non-primate brains. This page was last modified on 23 June 2016, at 15:00.